Set aside in fridge till needed. Thoroughly combine all ingredients, including the dressing. For best flavor, chill for 2 to 4 hours before serving. This pasta salad needs to chill for a few hours before eating for the best flavor. 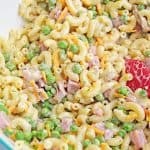 Pasta salad can be kept in the fridge, tightly covered for 3 to 5 days.